Situated at the outside the Cinema entrance of the Westfield in Chermside this is one of several similar restaurants on that strip. I went there with a friend for a quick snack and a cup of coffee and ended up having a long talk with the owner. The food here is typical of the area: a mid priced wide selection of dishes that is well made and presented. The owner revealed that in fact he starts early in the morning so that they make their own sauces fresh for the day. Most similar restaurants in Brisbane buy their sauces pre-made from factories. Another standout feature of this restaurant are the drinks. On display on the wall are numerous bottles of fine wine. However as more young people have been heading out to dine the Café La Vie has switch more to cocktails and mixed drinks. 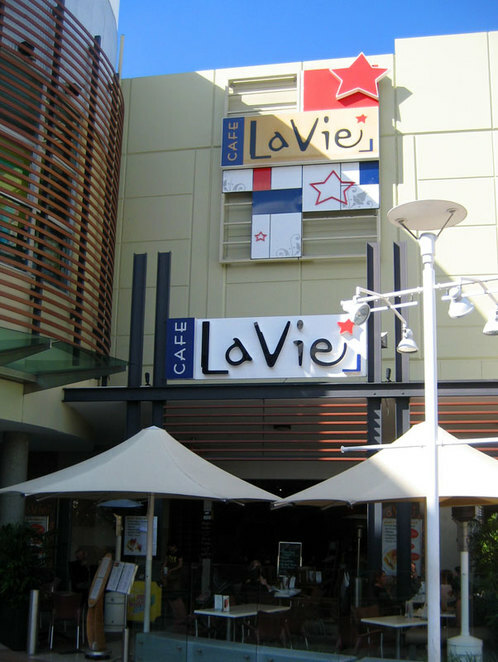 If you want a fairly standard meal at a standard price this is just one of several options in Chermside, if you want a great selection of wines and cocktails while you eat without going to a pub or an upscale restaurant, Café La Vie is the standout choice in Chermside.